After last weekend’s high winds and rain that was measured in feet, followed by this week’s rising rivers and standing water in fields, early farm reports are confirming pre-storm worries about losses to tobacco, cotton and corn crops. North Carolina industry leaders remain anxious about whether sweet potatoes and peanuts — grown beneath the soil and susceptible to flooding — will suffer greatly as well. 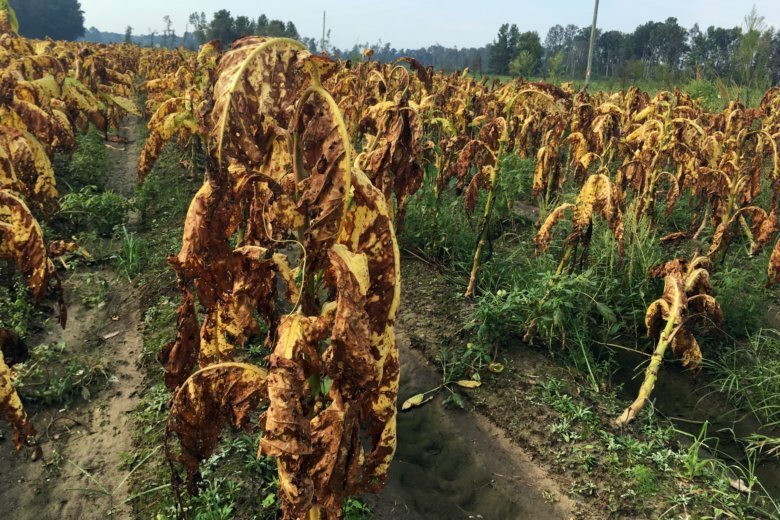 About 40 percent of the tobacco crop remained in the field when Florence arrived, Boyd said, with the highest-quality leaves yet to be harvested. Leaves began “melting on the stalk” — disintegrating when sunny skies followed heavy rains and standing water. On the 5,000 acres (2,023 hectares) that Craig West’s family farms on near Fremont — about 50 miles (80 kilometers) southeast of Raleigh — the biggest moneymaker is the 500 acres (202 hectares) of tobacco. Sixteen inches (41 centimeters) of rain there made it impossible to harvest the leaves still in the fields in time, even if the winds hadn’t battered them so that they were about as appealing and saleable as a bunch of bruised bananas, West said. Dalesio reported from Fremont, North Carolina. Associated Press writer Meg Kinnard in Columbia, South Carolina, contributed to this report.